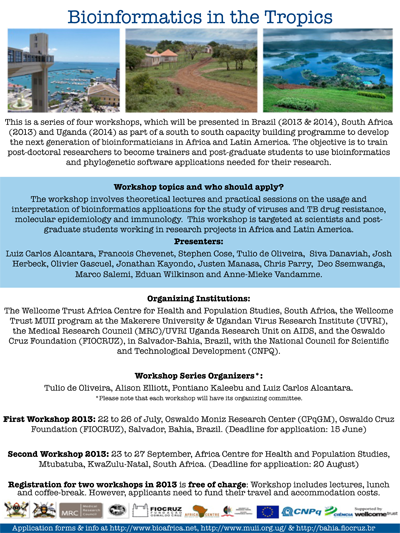 This is a series of four workshops, which will be presented in Brazil (2013 & 2014), South Africa (2013) and Uganda (2014) as part of a south to south capacity building programme to develop the next generation of bioinformaticians in Africa and Latin America. Workshop topics and who should apply? The workshop involves theoretical lectures and practical sessions on the usage and interpretation of bioinformatics applications for the study of viruses and TB drug resistance, molecular epidemiology and immunology. This workshop is targeted at scientists and post-graduate students working in research projects in Africa and Latin America. The objective is to train post-doctoral researchers to become trainers and post-graduate students to use bioinformatics and phylogenetic software applications needed for their research. *Please note that each workshop will have its organizing committee. European Union, CDC/PEPFAR, Wellcome Trust, National Council for Scientific and Technological Development (CNPQ).